Protecting your eyesight is an important part of maintaining your quality of life. Here are five simple things you can do to help preserve your vision. It is no secret that smoking is strongly linked to many health problems; however, did you know that it can also damage your eyes and vision health? Smoking increases your risk of developing cataracts, macular degeneration and glaucoma. In addition, smoking increases your risk for diabetes and its many complications, including new blood vessel growth, diabetic retinopathy and permanent vision loss. 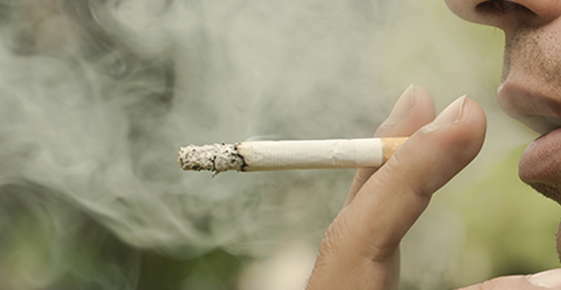 Cigarette smoke can also irritate your eyes and cause dry eyes. This can cause general discomfort and make wearing contacts uncomfortable. In order to function optimally, our eyes require a wide assortment of nutrients. Certain vitamins, including vitamins A, C and E, are instrumental in protecting your eyesight and can be found in brightly colored vegetables, such as carrots, sweet potatoes and pumpkins. Your eyes also need antioxidants, such as beta-carotene, lutein and zeaxanthin, to protect against sun damage. Dark leafy greens, egg yolks and yellow peppers are dense with these antioxidants. Physical exercise is an essential part of maintaining your overall physical health. Regular exercise can help lower blood pressure, release tension and reduce the risk of diabetes and heart disease. It can also be highly beneficial for your eyes. Research has shown that regular exercise lowers your likelihood of developing some serious eye conditions, including reducing the risk of age-related macular degeneration by nearly 70 percent. In addition, physical exercise can reduce pressure and improve blood flow to the retina and optic nerve. This may help slow general vision loss from diseases such as glaucoma. Getting quality sleep is important for your eyesight. It helps prevent your eyes from drying out and being overly strained. Sleep allows your body to recover and heal from the previous day. This is especially important if you spend the majority of your day sitting at a computer or looking at electronic screens. Aim to get between seven and nine hours of sleep each night to counteract some of the strain you put on your eyes throughout the day. In today’s online world, most people spend many hours staring at a computer screen or alternative electronic device. However, technology can cause permanent damage to your eyes. Spending too much time staring at electronic screens can cause discomfort, including dry eyes and eye strain. For many people, it can even cause persistent tension headaches. Although in this day and age, it is difficult to turn away from screens entirely, you can protect your eyes from excessive strain by looking away from your screen for a few minutes every hour to give your eye muscles a break. "Dr. Ohde spent so much time with me during my examination. Very professional and courteous! And the staff is AMAZING!! AND!! THEY HAD POPCORN"
"Exceptional experience! Dr. Ohde and his knowledgeable team are efficient, friendly and professional."